I've spent this year as a ghost and I'm not sure where home is anymore. Their sound is pretty much the same as that of Four Year Strong, and I don't suppose that is a bad thing. In fact, Alan and Dan from FYS supply guest vocals on track 6, "Summers in PA." I'm diggin on track 5, "My Life As a Pigeon." Apparently the cohesive story is supposed to be the band's complaints about touring, but I still like how some of the complaints can be translated to life. And with that, I ask you to embrace beardcore. Yes, it is just going to keep happening. We are going to keep subdividing musical genres until everyone gets their identity boxed right up for you. I happily use the term because it was pretty much named for Four Year Strong, a band I will always respect. What the hell, though. We analyze and categorize every goddamn detail of our lives as we try to justify its worth;, we might as well analyze and categorize our art too. 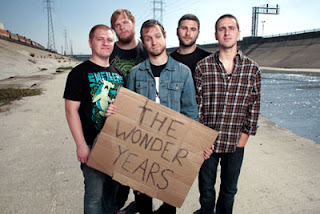 The Wonder Years actually does a very nice job tying this album up and allowing the inspiration from the poem to shine through with more than just an homage in the title. You can find snippets throughout the tracks, song names, and a summation in the final track on the album, "And Now I'm Nothing."